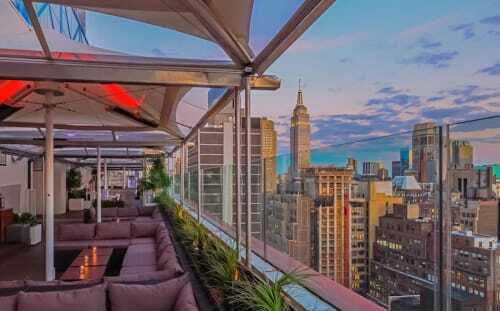 The Sky Room takes NYC nightlife events and experiences to the next level. The venue’s North Terrace provides breathtaking views of the Manhattan skyline. The panoramic glass walls and retractable roof allows guests to enjoy their private events through every season and in any weather. The South Terrace of the Sky Room provides intimacy for guests to immerse themselves with views of the Hudson River and Empire State building. With a dynamic and diverse menu of food and drinks, live music, amazing views, the North and South Terrace of the Sky Room provides the ultimate event experience.